Gecko Head Gear Recommend Pairing Your Gecko Headset with an Icom Radio. Icom radios are specifically designed with the marine environment in mind, their handheld VHF marine radios are among the most reliable and waterproof on the market. Great features mixed with style are the traits of Icom’s new IC-M25 buoyant marine VHF radio which floats and flashes when dropped into the water. 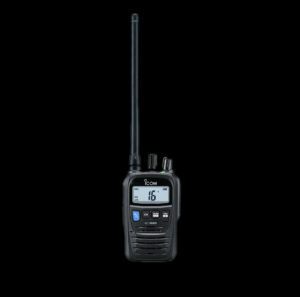 Sporting an elegant slim design, this new model has the lightest body in the market for a floating VHF radio, just 220g. New for an Icom, this new radio has a tidy USB connector for convenient charging from a variety of electronic devices. 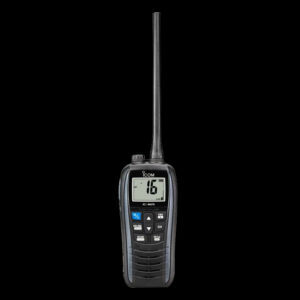 The IC-M73EURO is a powerful marine handheld that features 6 watts high output, a long battery life and a compact ergonomic body, as well as the following features; 700mW loud audio / 6W RF output power / IPX8 advanced waterproofing / slim, hourglass Body, wide viewing angle LCD. 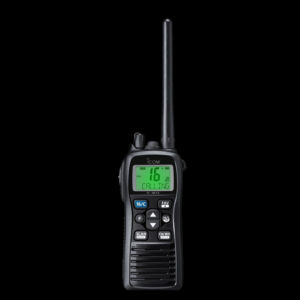 The IC-M73PLUS builds on many of the features that made the IC-M71 the choice of many maritime professionals across the globe but also incorporates two new important features; a new voice recording function and Icom’s active noise cancelling technology. Also features; bass boost function / 700mW loud audio / 6W RF output power / IPX8 advanced waterproofing / slim, hourglass body / wide viewing angle LCD. 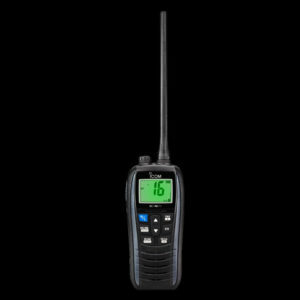 Designed with a particular emphasis on commercial use the IC-M85E is a high-class waterproof marine handheld that meets both marine and simple Private Business Radio (PBR) applications. Compact and with a robust modern construction, the IC-M85E contains critical commercial features including built-in voice scrambler ensuring private conversation and emergency features including Man down and lone worker function. The IC-M93D EURO VHF/DSC handheld radio is the successor to the popular IC-M91D. Stylish and slim, this new Icom handheld contains an abundance of features including a dedicated built-in DSC receiver (meets ITU-R M.493-13 Class D DSC), internal GPS and active noise cancelling technology. In addition, an intuitive interface coupled with 2.3 inch full dot matrix high-contrast display and soft keypad makes this a comfortable and easy hand portable to operate. Features also include; 2.3 inch Large High Visibility LCD / Slimmest* Buoyant DSC Radio / Intuitive User Interface / Float’n Flash and MOB Auto Set Function / Rapid Charger and Li-ion battery pack as standard / Active Noise Cancelling Technology / Integrated GNSS Receiver.